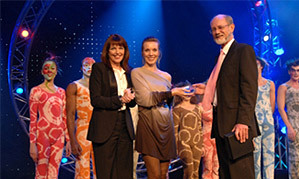 For the second consecutive year, the winner of the 2009 Sparkle Auditions was Reynolds Performing Arts, with their dance interpretation of the song ‘Human’ by the Killers. The subtle changes within the music of this song allowed the choreographer, Amanda Tooms-Peel, Head of Dance at Reynolds Performing Arts, to incorporate a number of different dance styles in the exciting and energy fuelled performance which opened the glittering national ceremony on 26 November 2009, at Old Billingsgate, London. Emma Reynolds, Principal of Reynolds Performing Arts, joined Amanda in accepting the award. Human is an athletic and technically demanding performance which was inspired by the musical arrangement and lyrics.